Ontario, California – Southern California heavyweight contenders Cristobal “The Nightmare” Arreola and Manuel “El Toro” Quezada will square off in a crucial battle to keep their hopes alive of becoming the first Mexican Heavyweight World Champion on Friday, Aug. 13, at Citizens Business Bank Arena in Ontario, Calif.
Never before have two legitimate heavyweight world contenders of Mexican descent faced each other in their prime. Arreola (28-2, 25 KOs), of Riverside, and Quezada (29-5, 18 KOs), of Bakersfield, know that this is a must win fight to stay relevant in the European-dominated heavyweight picture. The 12-round main event, which is presented by Goossen Tutor Promotions and sponsored by Soboba Casino, is for the WBC Mexican National Championship. The 29-year-old Arreola, who challenged world heavyweight champion Vitali Klitschko for the WBC crown less than one year ago, is looking to rebound from a hard-fought upset decision loss to Tomasz Adamek in April at Citizens Business Bank Arena. Arreola, whose roots stem back to Durango, Mexico where his father Augustin Arreola grew up selling seeds and shining shoes until he made his way to the United States in search of a better life for his family. Now, the East Los Angeles native needs to defeat Quezada to re-emerge as a world title contender. 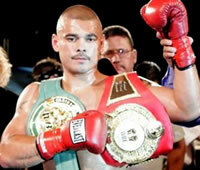 “My job in here is to win this fight and to take care of history,” Arreola said. “This is the first time that two fighters of Mexican descent, or basically any descent, have tried to knock each other off just to make history on their own. Arreola knows that he won’t be the only fighter in the ring on Aug. 13 looking to stay on the path towards becoming a Mexican Heavyweight World Champion. The colorful Arreola, who has 25 KOs in 28 career victories, is refocused on his boxing skills after a disappointing performance against Adamek. Quezada, 32, is coming off a shocking setback in April to Jason Gavern. The native of Wasco, Calif., Quezada needs a triumph over the hard-hitting Arreola to keep his heavyweight dreams alive. Quezada’s father, Roque Quezada, was born in Caseta, Chihuahua, Mexico and his mother, Graciela Quezada was born in Aguascalientes, Mexico. Now divorced, Manuel’s parents met and married in Mexico and came to the U.S. in 1976 when they were in their early 20’s working in the northern fields of California. Quezada is training under new management with an improved attitude toward achieving his goal of a world title shot and believes this is his time to show he belongs. “He’s not the only one that’s trying to make history – so am I,” Quezada said. “This is my biggest fight,” Quezada said. “This is my Super Bowl, my chance to make history. I haven’t fought in a bigger fight than this, but I’ll be ready to fight. Tickets, starting at just $29, are on sale for the vitally important showdown between two of California’s most highly regarded heavyweight contenders. Tickets (parking included with purchase) are available at Citizens Business Bank Arena Box Office and Ticketmaster.com. For more information, please visit www.CBBankArena.com. Undercard bouts will be announced shortly. Doors open at 5 p.m. with the first fight set at 6 p.m. The main event is slated for 7:15 p.m.
CLICK HERE TO VISIT GOOSSEN TUTOR PROMOTIONS YOU TUBE PAGE.